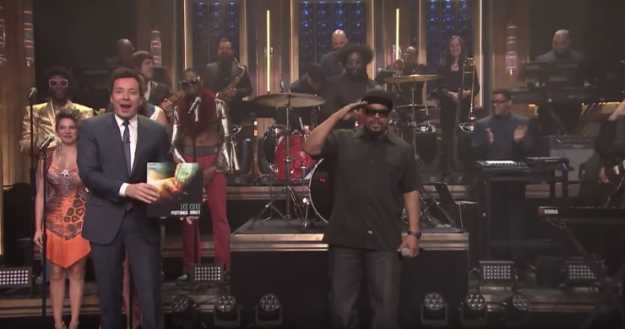 On Friday night, Ice Cube paid a visit to The Tonight Show Starring Jimmy Fallon to perform a track of his long-awaited, just-released new album, Everythang's Corrupt. The new album marks his first official release since 2010's I Am the West. As Ice Cube noted to host Jimmy Fallon in the interview portion of his guest spot, the new album was inspired by the corruption the pioneering MC-turned-entertainment mogul sees in today's world. "Everything that you look around and you see...Man, it seems like money, greed, power, is involved. So it seems like everything is corrupt, so I just wanted to highlight some of the things we should be trying to change and fix, 'cus we can't keep going down this road." Ice Cube w/ The Roots - "That New Funkadelic"
"That New Funkadelic" is far from the first time Ice Cube has drawn from George Clinton's music and mythology in his own music. He's frequently sampled and collaborated with Clinton throughout his career on tracks like "Steady Mobbin'", "Dirty Mack", and "Bop Gun (One Nation)', which featured George himself. Ice Cube also appeared alongside Kendrick Lamar on Clinton's 2016 track "Ain't That Funkin' Kinda Hard On You". George Clinton clearly appreciates the way younger generations of artists like Cube and Kendrick have embraced his sound and aesthetic. He recently referred to artists like Kendrick, Flying Lotus, and Thundercat as "the new generation of funk musicians."